It is fair to say the world has gone ‘insane’ for Shaun T. His intensive fitness regimes, Insanity and Hip Hop Abs, have sold over 10 million DVDs gaining him worldwide notoriety and a dedicated following. Capitalising on his success, Shaun T came to the UK to launch his latest endeavour – EPR Nutrition ‘The Shaun Range’ - a range of innovative sports nutrition supplements. 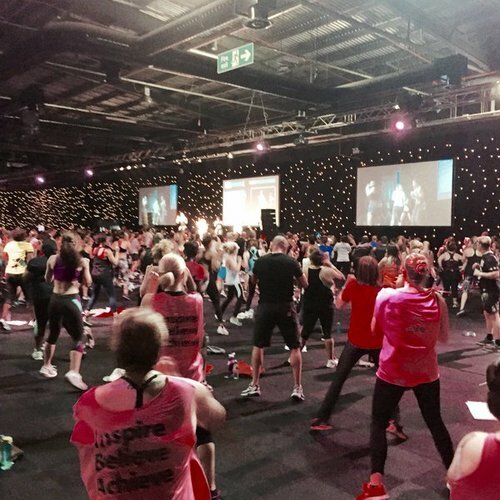 To launch The Shaun Range, Event City Manchester hosted a Shaun T Live workout on 27th February 2016. Over 800 fans attended, working out en masse with Shaun and taking part in a live Q&A afterwards. EPR wanted a social wall in order to utilise Shaun T’s substantial online following to promote the new products. EventBeat was appointed to power and moderate the screens at the event, creating interactive content for the participants, encouraging questions for the Q&A as well as promoting the new product range. The screens broadcast individual advertisements for each product, interspersed with tweets and photos of the crowd. Before the event the EventBeat team were inundated with selfies of the excited crowd wanting to have their picture appear on the screens. The participants had come from all over the UK to attend the event, making the interactive element extremely effective, even attracting motivational tweets from fans and friends at home! Participants were obviously unable to take photos or tweet during the work out, so a member of EventBeat took action shots of people as they exercised, broadcasting the best ones on the screen alongside motivational tweets. This proved to be extremely popular, with many people approaching the EventBeat team afterwards wanting to have their photos sent to them directly so they could share them on their own social media. The interactive element of the EventBeat platform encouraged the crowd to pay close attention to the screens throughout the occasion, significantly increasing the number of views the product advertisements received. The hashtag #takingyoufurther enabled questions to come through immediately to the EventBeat moderators before and during the event so by the time of the Q&A there was a catalogue of questions ready to go. EventBeat cherry picked the best questions avoiding any difficulties that can sometimes arise with audience participation. SHAUN T_EPR_01 from EPR Nutrition on Vimeo.